Fox New host Bill O’Reilly called out CNN anchor Don Lemon Tuesday, saying that Lemon refused to cover a story regarding former National Security Adviser Susan Rice on his program. Lemon was not having it. O’Reilly tweeted a video of Lemon, which O’Reilly said showed the CNN host refusing to cover a story about Rice, who has been accused of leaked classified information to the press and made requests to unmask the identities of U.S. persons in intelligence reports for political purposes—both of which Rice has denied. In the video, Lemon said that he will not “insult the intelligence” of his viewers by repeating baseless allegations that Trump and his team were illegally wiretapped. He did not mention Rice in the clip. 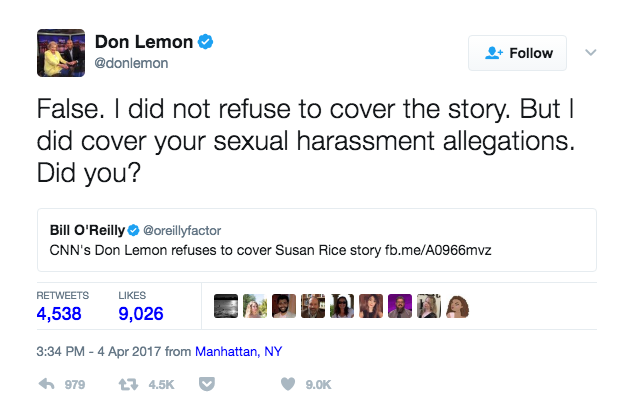 Lemon shot back on Twitter, denying that he refused to cover the story and referencing the multiple women who have accused O’Reilly of sexual harassment.